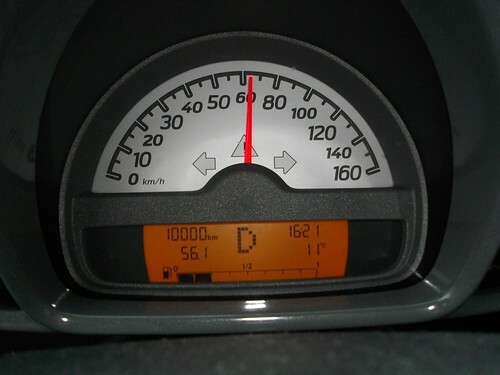 Today I hit the 10,000 km mark on Zaphod, my beloved Smart Car! I have driven a lot. Part of this is because I drive 35 km each way to get to work and part of it is because I do a lot of driving for work. The territory covered by the organization for which I work is *huge* and I’m often having to go to places for meetings or site visits or suchlike. 2 As a comparison (and to make me feel better), my dad bought a new truck on the same day I bought Zaphod and he has put more than 20,000 km on his. 7 cents per km isn’t too bad for gas, especially given the fact that I have to buy the premium gas, as apparently Smarts are “designed for” the expensive gas and if you don’t use it, you’ll void your warranty. I do try to take advantage of the fact that I am often out in places like Abbotsford for meetings and gas is generally cheaper in Abby, so I try to fill up when I’m there. Based on these numbers, I estimate that I’ll drive ~23,000 km and spend ~$1,600 in gas in a year. According to Transport Canada4, the average per year for car drivers is 15,400 km5). The average fuel economy for cars is listed at 9 L/100km, although this is data from four years ago and I’d be interested to see if it’s any better today. 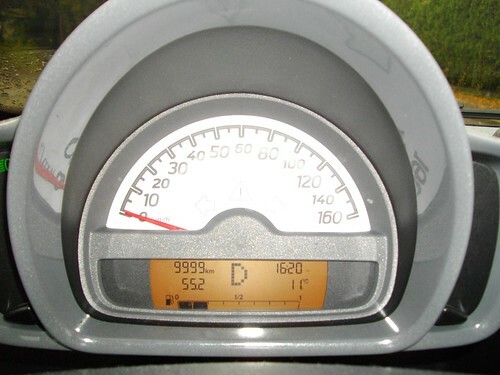 Did you actually take the 10,000 km shot while driving? I did. Totally irresponsible, I know. But I lined up the shot while at a stop light and then when I saw that I'd hit 9,999 and then 10,000, I snap a couple of pics without looking and hoped that at least one of each worked.